This morning's launch of the Algida Valletta Beach Volley in the City. The iconic St George’s Square in Valletta will be celebrating summer by hosting a beach volleyball tournament for the first time ever for Valletta 2018! The square, surrounded by the Grandmaster’s Palace, the Main Guard, and other key landmarks, will be transformed into a virtual beach volleyball court for The Algida Valletta Beach Volley in the City between the 17th and the 22nd of July 2018. An arena filled with a staggering 50 tonnes of sand and an inflatable pop-up court will be set up in the middle of the square for this event, which spans over six days. 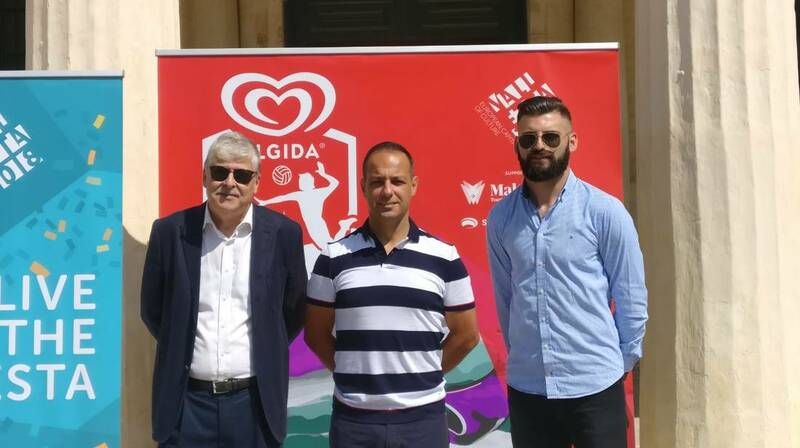 The Algida Valletta Beach Volley in the City, which forms part of the Valletta 2018 Cultural Programme, aims at promoting volleyball as a sport as well as the importance of an active lifestyle. By promoting physical activity and encouraging people to engage in sports, this event will become another part of Valletta 2018’s legacy. This event is being organized by the Valletta Volleyball Club in collaboration with the Valletta 2018 Foundation, supported by the Malta Tourism Authority, Sportmalta, the Malta Volleyball Association the Maltese Olympic Committee and Algida. Entrance is free.